For the (small) business. HP's ProBook 650 is a new mainstream business notebook. It is well equipped with a docking port, 5 USB 3.0 ports, a matte display as well as a Haswell processor and it is also interesting for private users with a retail price of 750 Euro (~$1025). 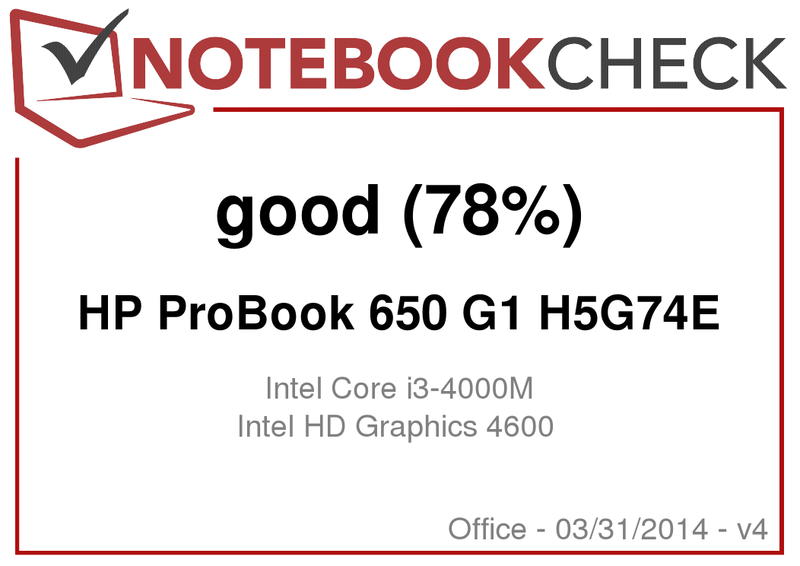 We have a closer look a the ProBook 650 in our review. 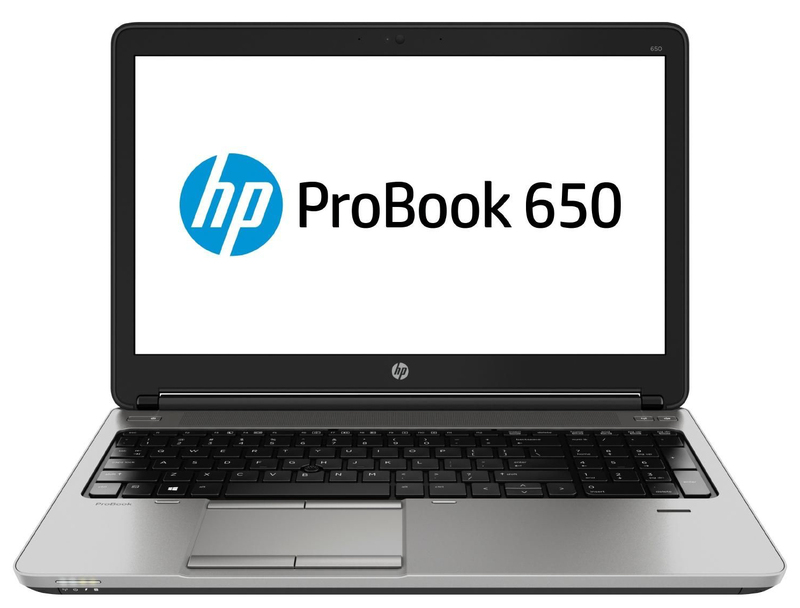 Hewlett Packard introduces the successor of the numerous ProBook 65xx-series with the ProBook 650. 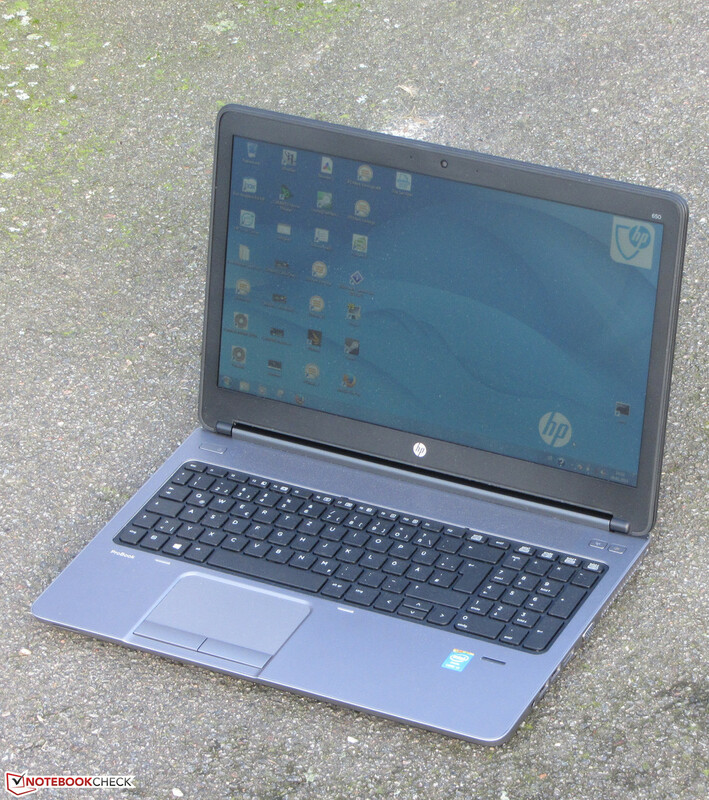 We reviewed many of the predecessors – for example a current ProBook 6570b (Core i5-3320M, Radeon HD 7570M). 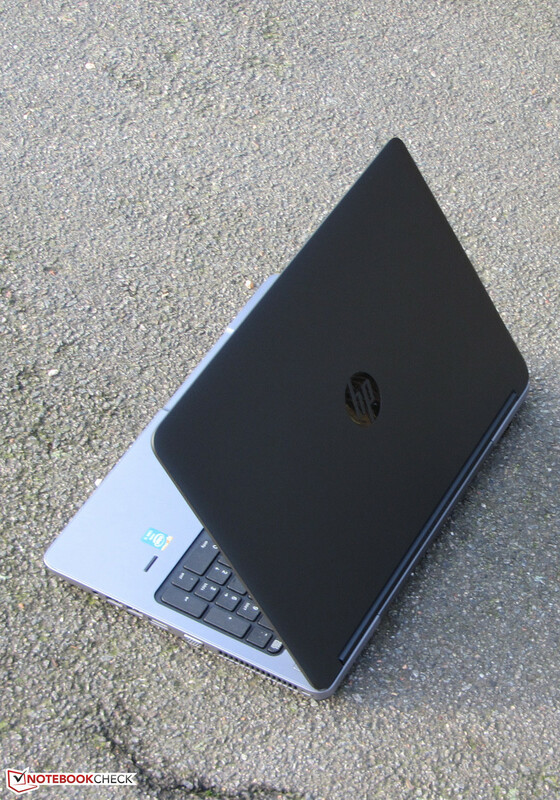 HP offers mainstream business notebooks within the 65xx-series, and all devices so far could convince us with a sturdy case, a good build quality, excellent maintainability and of course many business features. Can HP's latest series convince us as well? Find out in our review. We use the rivals Lenovo ThinkPad L530 (Core i5-3360M, HD Graphics 4000) and Dell Latitude 3540 (Core i5-4200U, Radeon HD 8850M) to classify the notebook. 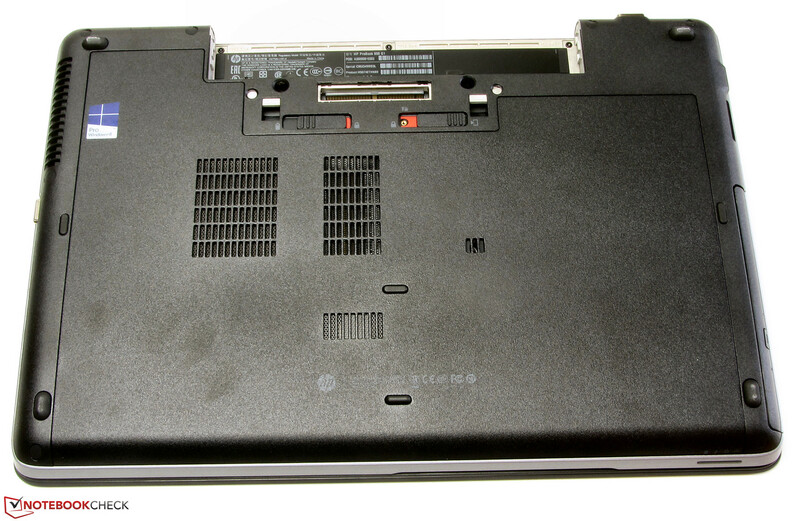 The ProBook is completely made of plastic and the same applies for the ThinkPad. Dell on the other hand uses metal elements for the Latitude. The design of the ProBook is quite appealing; HP uses a simple and business-oriented design without any curlicues. The top of the base unit is silver-anthracite while all the other parts are black. 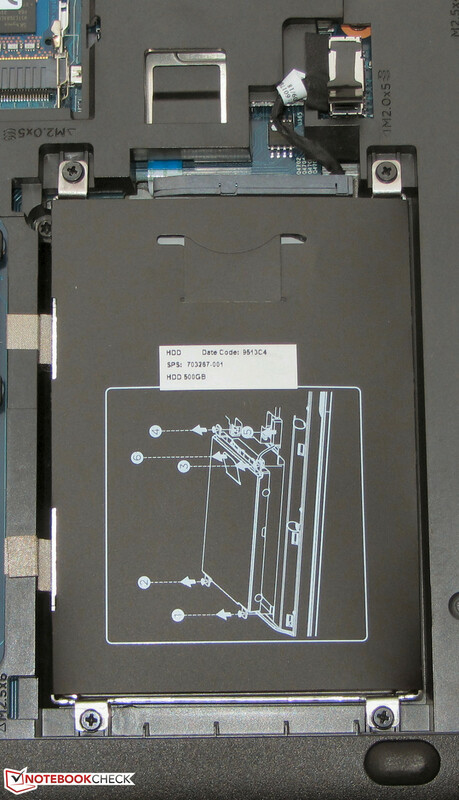 The top of the display cover is also rubberized and reminds us of ThinkPads. We cannot criticize the stability and build quality of the base unit. It is very sturdy and there is hardly any reaction to pressure. The torsion resistance is also okay, however, a notebook that was designed for the road should be a tad stiffer. All in all, still a good result, but that cannot be said about the display cover. It is very easy to twist it and it is susceptible to pressure from the back. 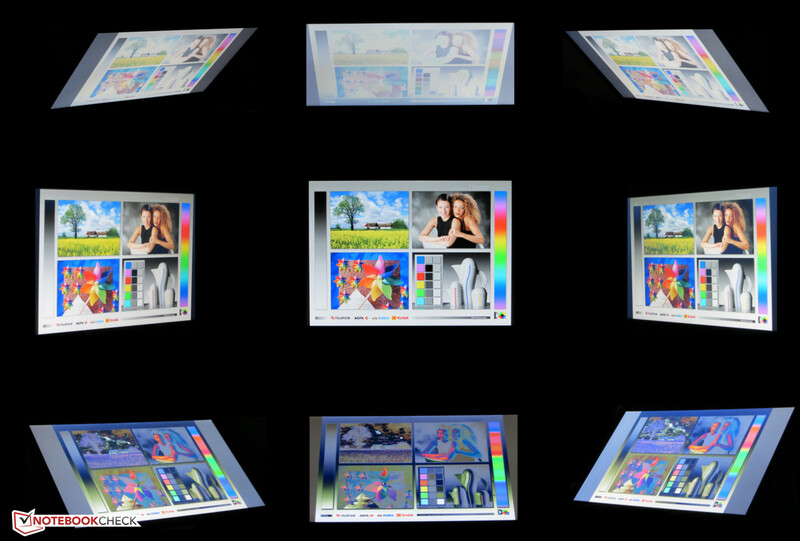 We can bend the whole cover including the display and we can see picture distortions. The hinges do a good job and keep the display in position, but there is still some bouncing. It is possible to open the lid with one hand. The ProBook 650 has a business-oriented design. 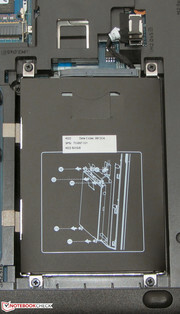 HP uses a rubberized display cover. The notebook has a large maintenance cover. 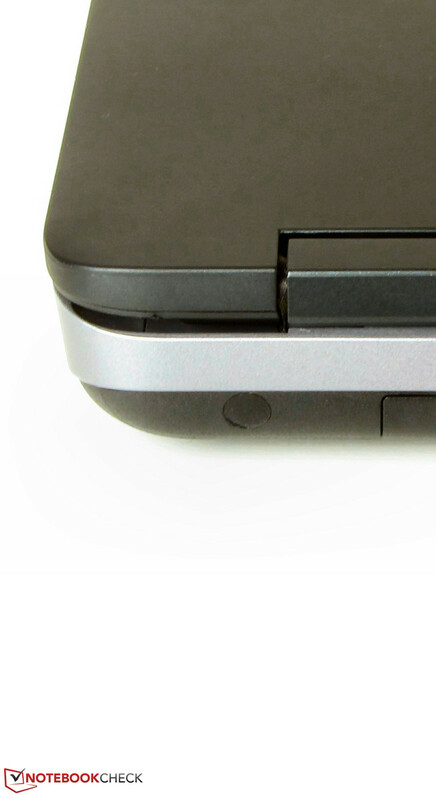 The port layout of the ProBook is convenient, but some ports on the right side are too far at the front. 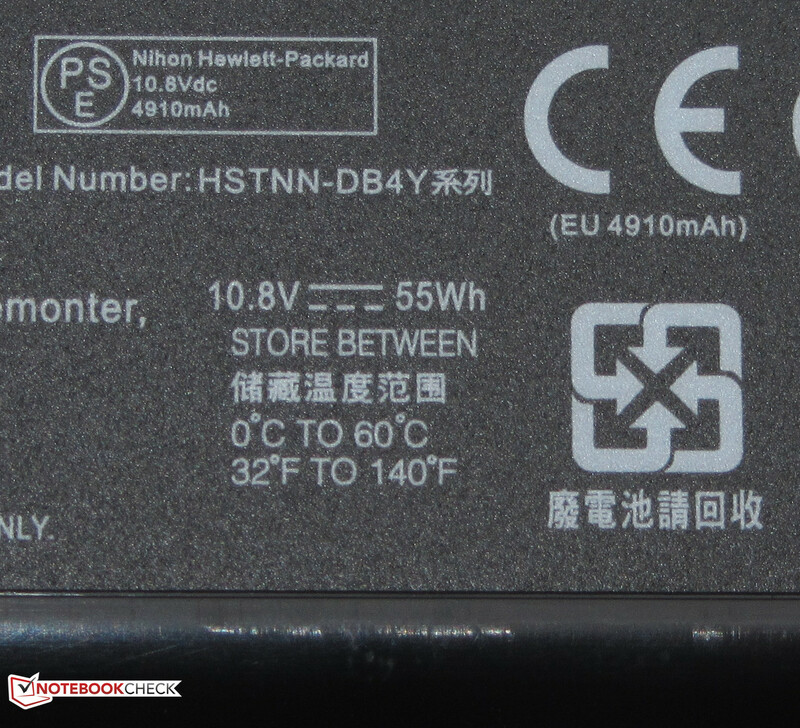 Hewlett Packard did not save any money and equipped the ProBook with five USB 3.0 ports, ThinkPad and Latitude only have one or two of these ports, respectively. All three devices have a VGA port, but only the ProBook and the ThinkPad have a digital video-out (DisplayPort) as well. 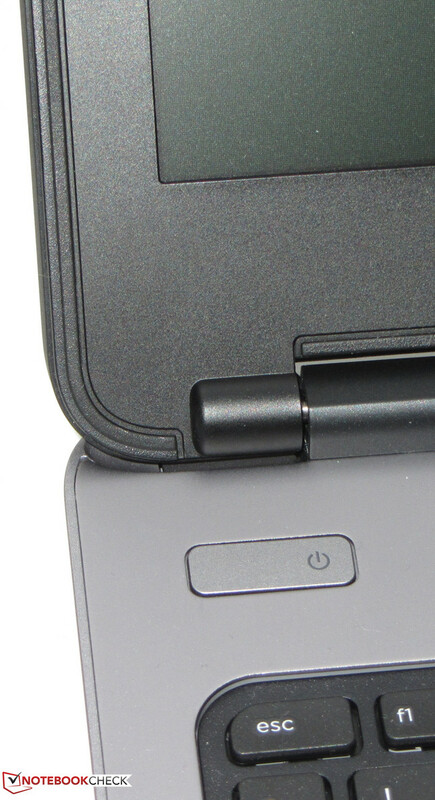 These two notebooks also offer a docking port. 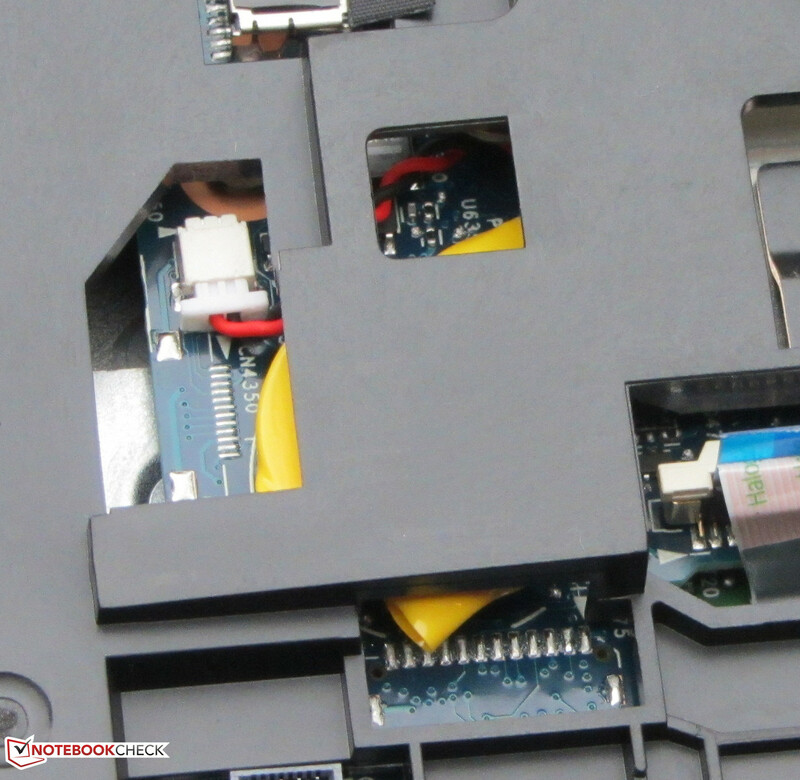 The ProBook is the only notebook with a serial port. This port is not usually important for private users and was – similar to the parallel port – replaced by USB. It is however still used in business environments – for instance, for the maintenance of cashier systems. The big advantage is the quite simple programmability and the related connections/wires can be several meters long. The serial port is at the back. 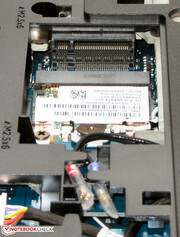 The docking port of the ProBook. 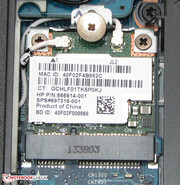 The WLAN module of the ProBook is provided by Broadcom (BCM43228) and supports the WLAN standards 802.11 a/b/g/n. Windows always showed the maximum number of bars, even with a distance of 15 meters (~49 feet) from the router. This is however not a standardized test. The Gigabit Ethernet chip is from Intel (I217-V) and there is also a Bluetooth 4.0 module. The webcam takes noisy pictures with a resolution of up to 1280x720 pixels. You can also equip the ProBook with a 3G/LTE modem if you need Internet on the road, but our review unit did not have the required module. The notebook is already prepared for such a module: SIM card tray and antennas are already integrated. The ProBook is primarily designed for business users, so there are also several security features. Besides a Trusted Platform Module 1.2 there is a fingerprint reader as well. 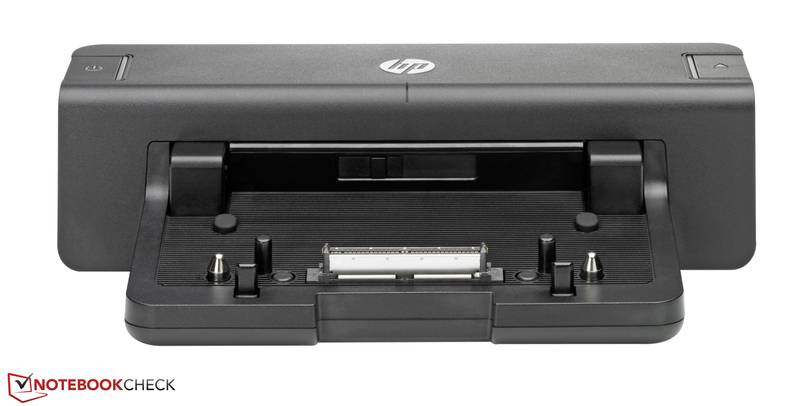 In combination with the preinstalled tool HP Client Security, you can realize system access via fingerprint scan and HP's File Sanitizer enables safe deletion of files. Besides some warranty information, a quick start poster and a brochure for available accessories there are also three DVDs in the box: One application and driver recovery DVD as well as one setup DVD for Windows 7 Professional (64-bit) and Windows 8 Professional each. There is even a printed manual for the Windows 8 installation. According to the provided brochure, Hewlett Packard offers the same accessories for the ProBook 650 as they did for the predecessors. You can get either the standard Docking Station (A7E32AA, A7E34AA; around 120 Euros/~$164) or the Advanced Docking Station (A7E36AA, A7E38AA; around 150 Euros/~$205) with an additional drive bay for an optical drive or a hard drive, respectively. The ProBook comes with a preloaded version of Windows 7 Professional (64-bit), but you can also install Windows 8 Professional (64-bit) since installation DVDs for both operating systems are provided. Access to the recovery features is possible via the Escape-button after you turn the notebook on. The menu also grants access to the BIOS and system diagnostics. The maintainability of the notebook is very good. A lever mechanism at the bottom secures the maintenance cover. You just have to loosen it and then remove the cover to gain access to the memory, hard drive, WLAN module, BIOS battery, CPU and the fan. The latter can be removed for cleaning purposes. 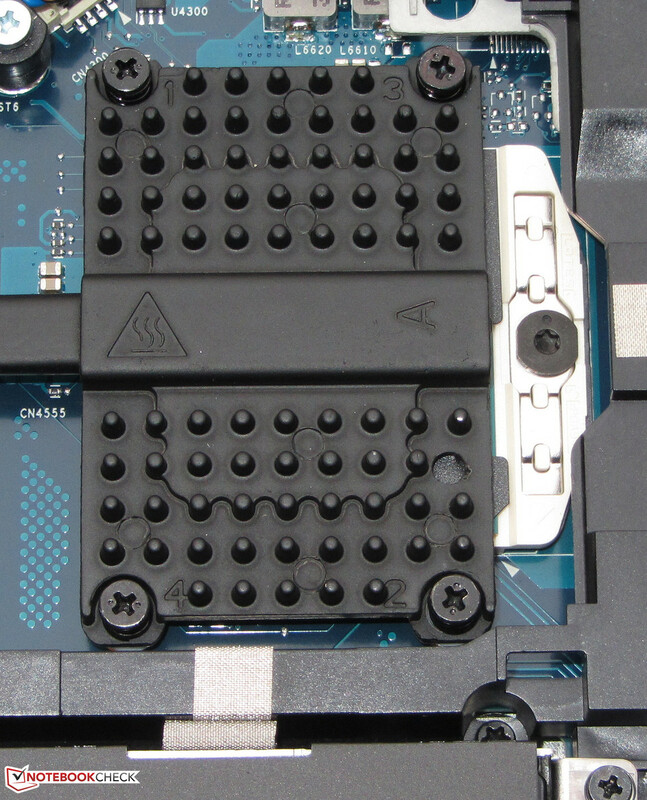 The ProBook has two memory slots and one slot is occupied by a four GB module. 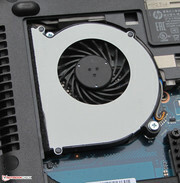 Replacing the hard drive is no problem and you can use 2.5-inch drives with a height of 7 and 9.5 mm. You can even replace the processor if you want to. Hewlett Packard grants a 12-month limited hardware warranty for the ProBook and the same applies for the ThinkPad. Buyers of the Latitude can select between a three-year Basic Support and a one-year Pro Support. There are several additional service upgrades for the ProBook, starting with a two-year warranty for around 50 Euros (~$68) up to a three-year worldwide On-Site warranty for around 240 Euros (~$328). 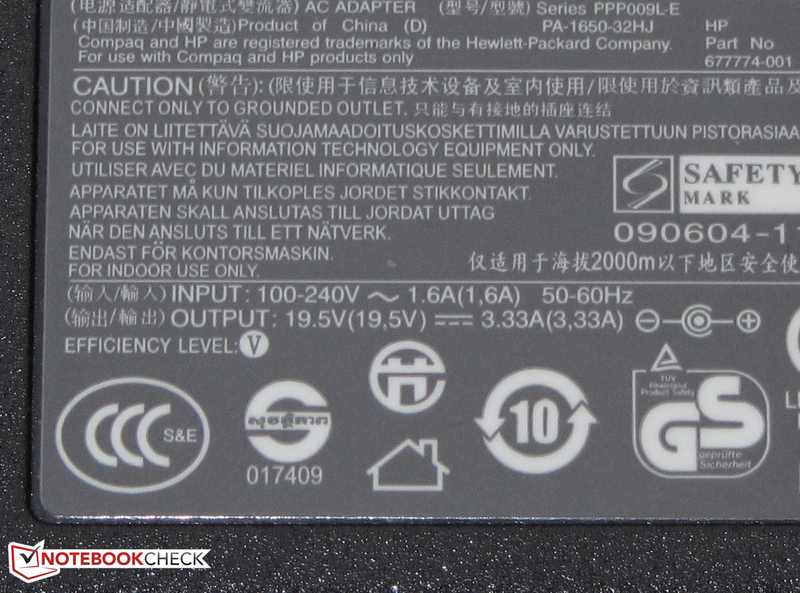 Hewlett Packard equipped the ProBook with a non-illuminated chiclet keyboard. 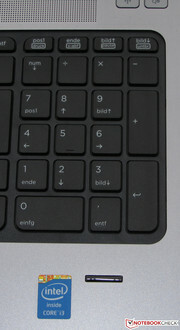 The main keys have a size of around 15 x 15 mm. HP uses flat and roughened keys, but unlike the ThinkPads, there is no conical curvature. The keys have a short travel, a clear pressure point and the necessary force is okay. 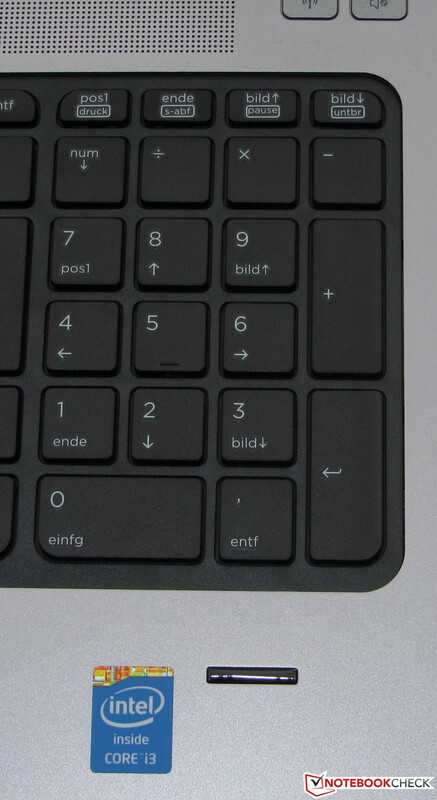 There is no bouncing in the main area during typing, only a little flex around the numeric keypad. The keyboard leaves a good impression, but cannot quite keep up with its ThinkPad counterpart. 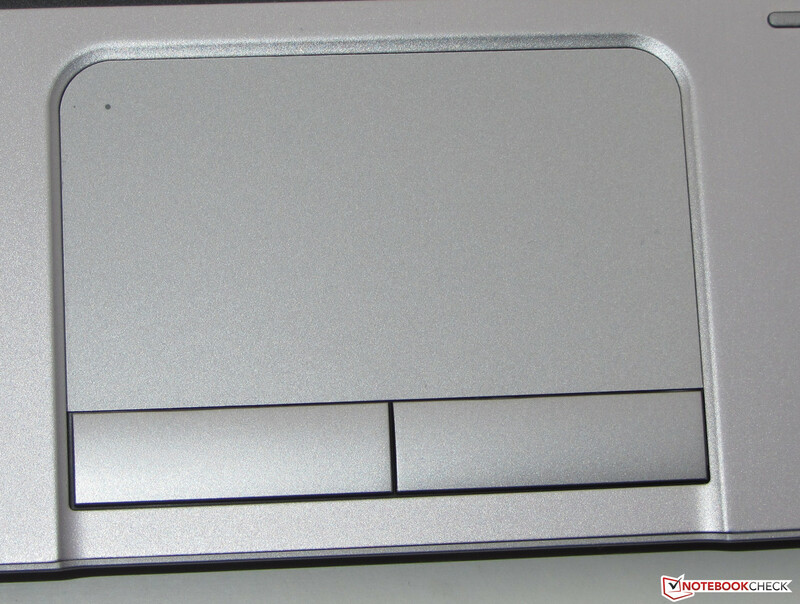 The touchpad of the ProBook is 10.4 x 5.9 cm (~4.1 x 2.3 inches) and supports multi-touch gestures. The surface is identical to the palm rest; the slightly roughened material provides good gliding capabilities. The touchpad enables a reasonably precise control of the cursor. Several multi-touch gestures can be configured and activated/deactivated in the associated control panel. Not all gestures are activated ex-works. You can also activate or deactivate the pad itself with a tap in the upper left corner; a small LED indicates the current status. The two mouse buttons have a clearly audible and perceptible pressure point in combination with a short travel. Hewlett Packard integrates a keyboard without background illumination. A matte 15.6-inch display with a native resolution of 1366x768 pixels is used for the ProBook, but you can also opt for a matte Full HD panel. The average brightness of the display is below average with just 186 cd/m²; ThinkPad (196.9 cd/m²; 1600x900 pixels) and Latitude (222.4 cd/m²; 1920x1080 pixels) are slightly better. The situation does unfortunately not improve in regard to the contrast (313:1) and black value (0.63 cd/m²). ThinkPad (726:1, 0.27 cd/m²) and Latitude (727:1, 0.33 cd/m²) are once again superior. 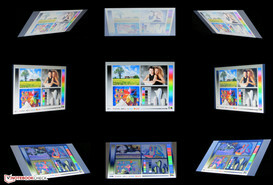 The ProBook display can cover neither the sRGB nor the AdobeRGB color spectrums, which are important for professional work, for instance, picture editing. We only measured 50.6 percent (sRGB) and 35.2 percent (AdobeRGB), respectively. The average DeltaE-2000 deviation is around 10.5 and therefore comparable with many low-cost notebooks. However, the ProBook does not belong in this category. The target area (DeltaE smaller than 3) is not reached by any color; the display also has a distinct blue cast. The combination of a low contrast ratio and the low display brightness is imperfect outdoors. 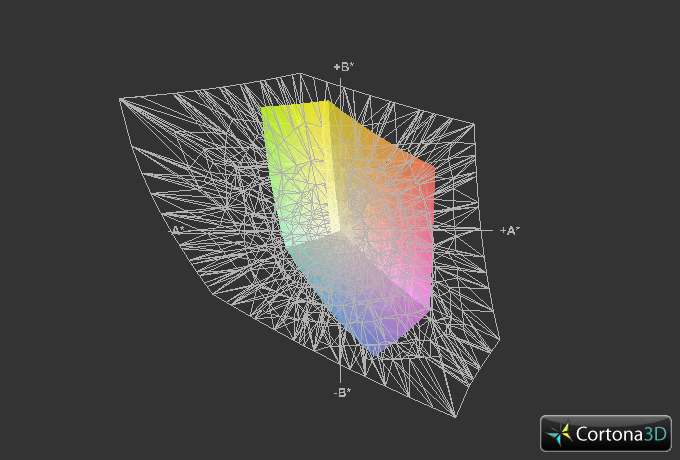 You can only see the display content if the environment is not very bright. We are not convinced by the viewing angle stability either. The performance is once again comparable to a low-cost device. The situation is okay with horizontal changes and even multiple persons can see the display content, but the picture does get darker with wider angles. A vertical change on the other hand quickly results in inverted colors. 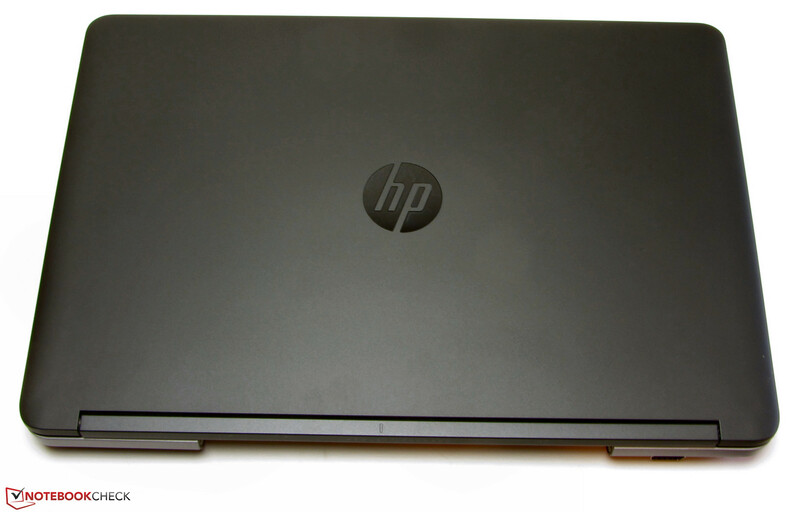 HP's notebooks from the ProBook 650-series are 15.6-inch business notebooks in the medium price range. The performance is more than sufficient for most office tasks, including web browsing and communication. The device is also equipped with security features like a Trusted Platform Module. Our review unit is the cheapest configuration and currently retails for around 750 Euros (~$1025). 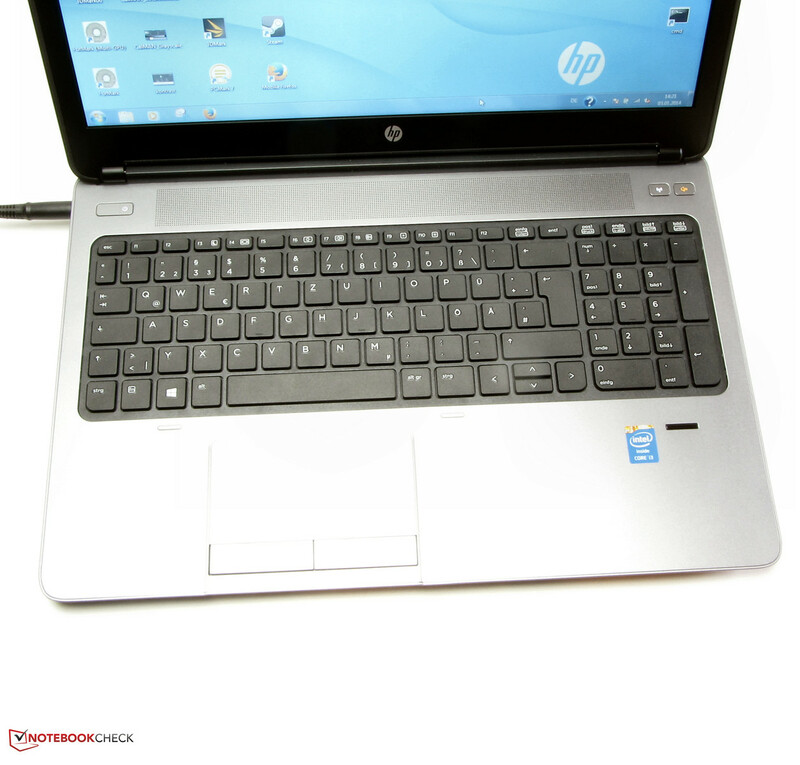 A look at the specs shows that HP offers numerous configurations of the ProBook. You can configure the CPU (Core i3 up to Core i7), memory, type and size of the hard drive, operating system as well as the display. There are also versions with a dedicated Radeon HD 8750M GPU. 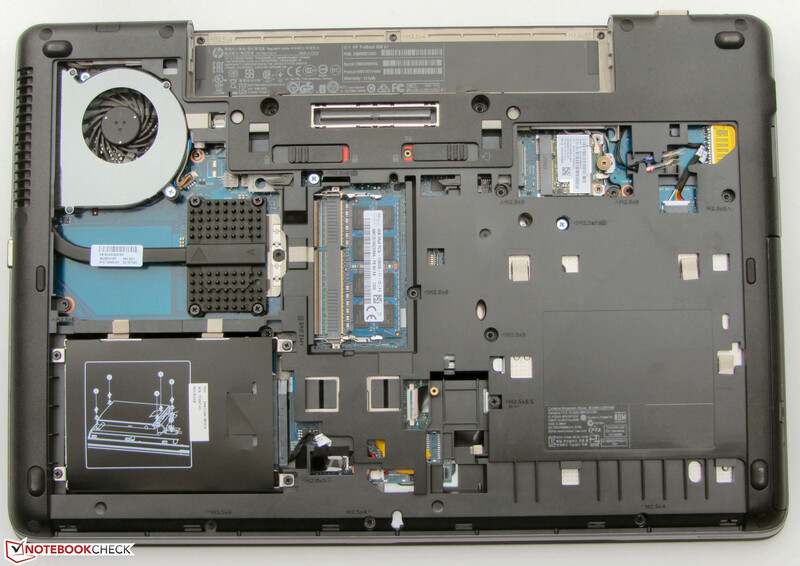 A cheaper alternative to the ProBook 650 is the ProBook 655-series. It is basically the same device, but instead of Intel processors, you get AMD APUs. The least expensive configuration is currently the HP ProBook 655 G1 F2R44UT with an AMD A4-5150M for 620 Euros (~$847), the rest of the specs are identical to our review unit. 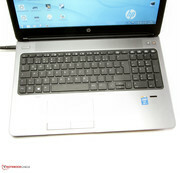 HP equipped the ProBook with a Core i3-4000M processor. The dual-core CPU is based on Intel's current Haswell architecture and has a nominal clock of 2.4 GHz. There is no Turbo Boost, only support for Hyperthreading. The similarly clocked predecessor was the Core i3-3110M. Thanks to Haswell improvements, the Core i3-4000M should be around 10 percent faster. The CPU always runs with the maximum clock of 2.4 GHz during the Cinebench CPU benchmarks. The results can be compared with the Latitude (Core i5-4200U, Radeon HD 8850M), which is not very surprising since the ULV Core i5 inside the Dell has a maximum Turbo Boost of 2.3 GHz (for two cores) and therefore just slightly lower than our Core i3-4000M. Both processors are also based on the Haswell architecture. The ThinkPad (Core i5-3360M, HD Graphics 4000) has a clear lead because of the much higher clocks. The GL-benchmarks favor the Latitude with the dedicated Radeon GPU. The system is pretty fast and snappy, which is also a result of the fast 7,200-rpm hard drive. The PCMark results are consequently good as well. The Latitude (Core i5-4200U, Radeon HD 8850M) is on the same level because of the similarly powerful CPU, and the ThinkPad (Core i5-3360M, HD Graphics 4000) is once again ahead due to the faster processor. A Solid-State Drive has a positive effect on the system performance. Windows starts even quicker and the system is snappier. PCMark also benefits from flash storage; our SSD (Crucial RealSSD C300 64 GB) improves the PCMark 7 result of the ProBook by around 66 percent (4,255 points). Data can be stored on the Hitachi Travelstar Z7K500 hard drive. It has a capacity of 500 GB and works at 7,200 revolutions per minute, which is pretty rare in a notebook these days. CrystalDiskMark determines a reading speed of 121 MB/s while HD Tune shows an average transfer rate of 96.2 MB/s. These are very good results for a conventional hard drive and show the impact of the 7,200 rpm. The same applies for the 4K read and write speeds. 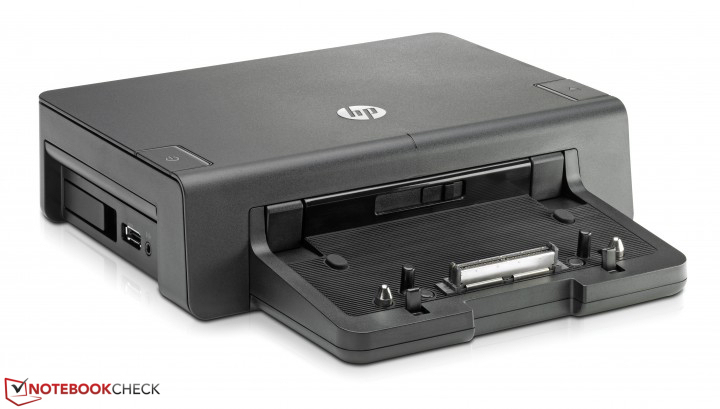 HP's 3D Driveguard technology protects the hard drive. It parks the read and write heads of the hard drive as soon as the sensor detects any vibrations or a drop of the notebook to avoid any damage of the mentioned parts. Graphics are handled by the Intel HD Graphics 4600. It supports DirectX 11.1 and works with a clock between 200 MHz and 1,100 MHz. Dell's Latitude (Core i5-4200U, Radeon HD 8850M) is ahead of the competition thanks to the dedicated Radeon GPU; the integrated versions just cannot keep up with that performance. The ProBook takes second place because the GPU is superior to the older HD Graphics in the ThinkPad (Core i5-3360M, HD Graphics 4000). The ProBook is not designed for gamers, but it is still possible to play many games in low resolutions and with low details. Some games should even run smoothly in the native resolution and higher settings – for instance, several titles from the FIFA-series. 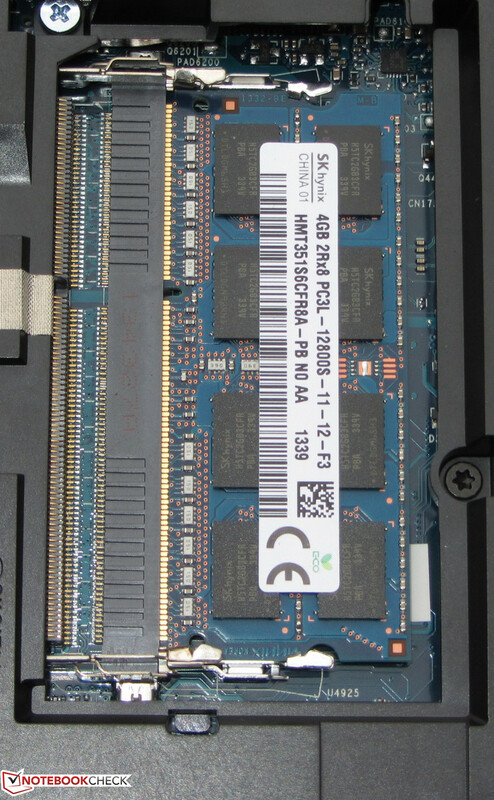 A second memory module would improve the frame rates, because the performance of the integrated GPU benefits from a dual-channel memory configuration. Frame rates can increase by up to 30 percent, depending on the title. We tested it with the game Tomb Raider: The dual-channel memory results in an average performance increase of around 28 percent with 60.1 fps (low), 27.7 fps (medium) and 15.7 fps (high), respectively. The ProBook configuration with a dedicated Radeon HD 8750M is a good option if you are looking for a business device that can handle current games. Another alternative is the Latitude with a slightly more powerful Radeon GPU. The ProBook is not a very noisy notebook, it is usually quiet and the fan is often deactivated during idle. The only remaining noise comes from the mechanical hard drive. We can measure between 31.6 and 32.6 dB(A) during idle, both the Latitude (31.6 up to 33.5 dB(A)) and the ThinkPad (31.8 up to 32.8 dB(A)) are on a similar level. Medium workloads (3DMark 06 running) and maximum load (stress test, Prime95 and FurMark simultaneously) result in a modest increase to 35.6 and 36.7 dB(A), respectively. The ThinkPad (33.2 and 37.8 dB(A)) is once again comparable, but the Latitude (40.2 and 43.5 dB(A)) is significantly louder. None of our competitors have heat problems. The surface temperatures during idle are very low, only the ThinkPad surpasses the 40 degrees Celsius (104 Fahrenheit) mark at one spot. All three devices surpass this mark at one spot at the bottom under load. Our stress test (Prime95 and FurMark simultaneously for at least one hour) results in the full CPU clock of 2.4 GHz, which is slightly reduced to 2.3 GHz on battery power. 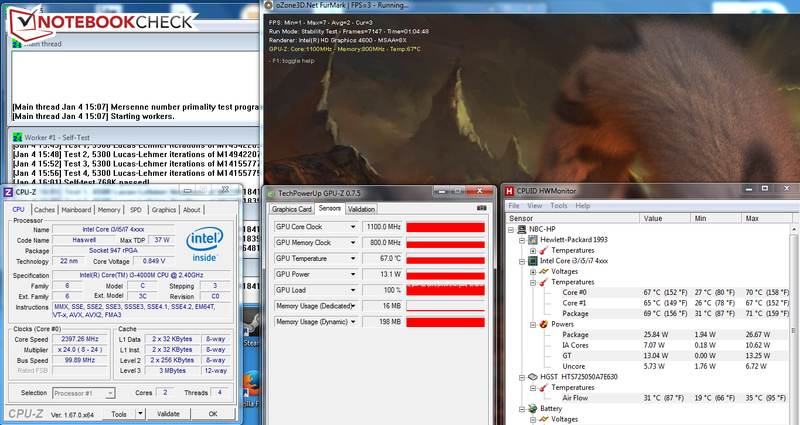 The GPU always runs with the maximum speed of 1.1 GHz during the stress test. The CPU temperature leveled off at around 70 degrees Celsius (with PSU; 158 Fahrenheit). (+) The average temperature for the upper side under maximal load is 27.9 °C / 82 F, compared to the average of 29.4 °C / 85 F for the devices in the class Office. (+) The maximum temperature on the upper side is 32.7 °C / 91 F, compared to the average of 33.9 °C / 93 F, ranging from 21.2 to 62.5 °C for the class Office. (+) In idle usage, the average temperature for the upper side is 25.9 °C / 79 F, compared to the device average of 29.4 °C / 85 F.
(+) The palmrests and touchpad are cooler than skin temperature with a maximum of 27.3 °C / 81.1 F and are therefore cool to the touch. (±) The average temperature of the palmrest area of similar devices was 28.2 °C / 82.8 F (+0.9 °C / 1.7 F). The stereo speakers of the ProBook are above the keyboard and behind a grille. The produced sound is a bit tinny and lacks bass, but voices are easy to understand. A better sound experience is available via external speakers or headphones. We measure an energy consumption between 4.6 and 9.4 Watts for the ProBook during idle, it is therefore more frugal than both the Latitude (6.3 up to 10.8 Watts) and the ThinkPad (8.8 up to 13.9 Watts). It is the same situation with medium (3DMark 06 running) and heavy workloads (stress test, Prime95 and FurMark simultaneously), the ProBook once again consumes less energy with 37.1 and 41.5 Watts compared to the ThinkPad (42 and 56.8 Watts) and Latitude (50.7 and 52.7 Watts). We should however not forget that Dell's notebook is equipped with a dedicated GPU. The ProBook manages an idle runtime of 7:41 hours, which is far behind the Latitude (12:34 h). We did not perform this test in our review of the ThinkPad. The Battery Eater Reader's Test is used for the idle scenario while the display brightness is set to minimum, the energy-saving mode is activated and the wireless modules are turned off. The runtime under load is 1:40 hours; the Latitude manages a couple of minutes more. This test was not performed on the ThinkPad either. 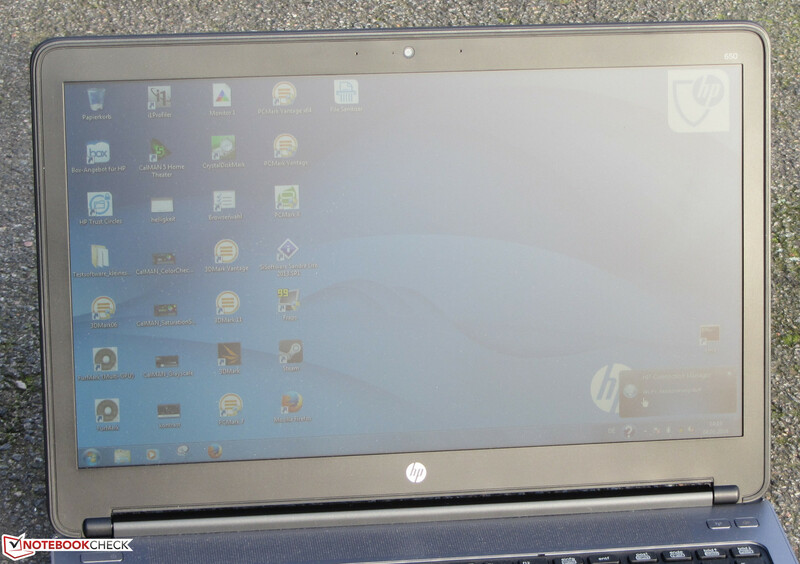 Our WLAN test results in 5:16 hours for the ProBook, which is comparable with the Latitude (5:34 h). Both devices cannot keep up with the 7:10 hours of the ThinkPad. This test simulates web browsing with a script that refreshes websites every 40 seconds. The energy-saving mode is once again activated and the display brightness is adjusted to around 150 cd/m². DVD playback on the ProBook finishes after 3:43 hours, but the Latitude is again superior. We have no results for the ThinkPad. Even though we only performed the WLAN test in our review of the ThinkPad, it should also be superior in the other disciplines. The reason for this is pretty simple, it just has by far the largest battery capacity (HP: 55 Wh, Dell: 65 Wh, Lenovo: 94 Wh). It is therefore not surprising that the ProBook has the shortest runtimes within our competition, but the results are decent nonetheless. 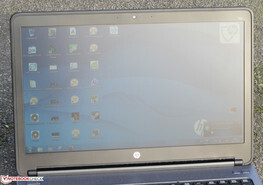 The Hewlett Packard ProBook 650 G1 H5G74E. 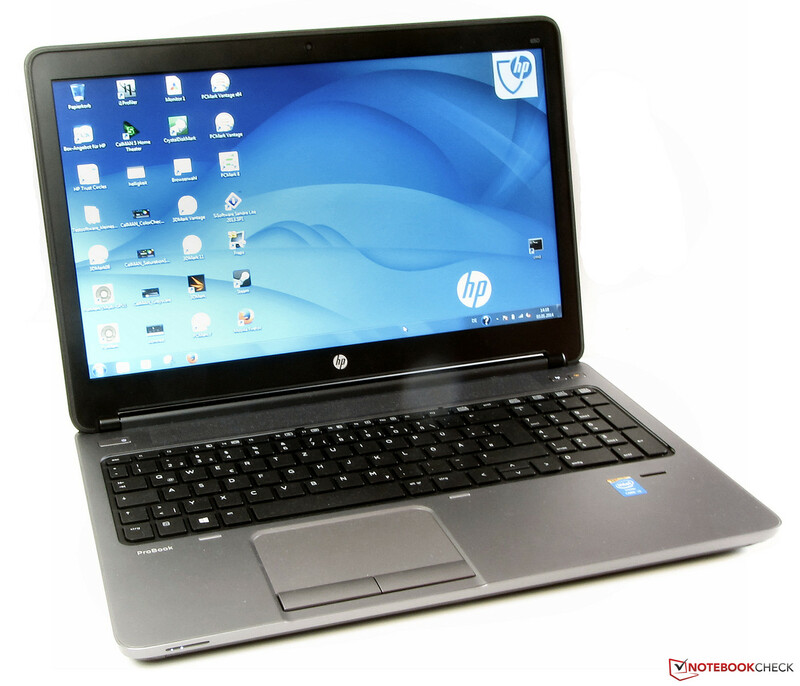 The HP ProBook 650 offers good application performance, it is usually very quiet and it has a comparatively fast hard drive. The notebook was primarily designed for business customers and was therefore equipped with good input devices. Maintainability and upgradeability are excellent and you can extend the comprehensive port variety via a docking station. Battery runtimes are also decent. The only serious drawback is the display quality. It is dark, has a low contrast and a distinct blue cast. The display cover is not very sturdy, either. Considering the retail price of 750 Euros (~$1025), the display is just not acceptable, both the brightness and the contrast should be better. 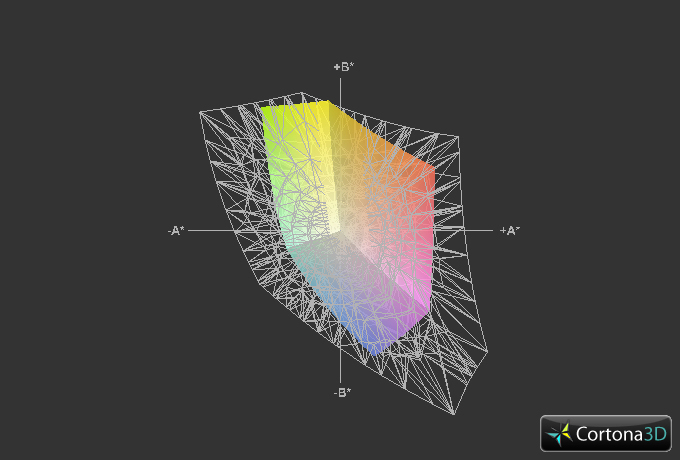 Even a Full HD panel and/or an IPS display would be possible. ProBook and Lenovo ThinkPad L530 are very similar in many respects. Advantages of the latter are the higher display resolution (1600x900 pixels) and the better keyboard. It is also cheaper: The ThinkPad L530 N2S4XGE with a Core i5-3230M, HD+ resolution and standard battery version is not sold anymore by Lenovo, but the same applies for the successor ThinkPad L540 with a Haswell processor. A configuration similar to our ProBook currently retails for around 690 Euros (~$888). We will review the ThinkPad L540 soon. 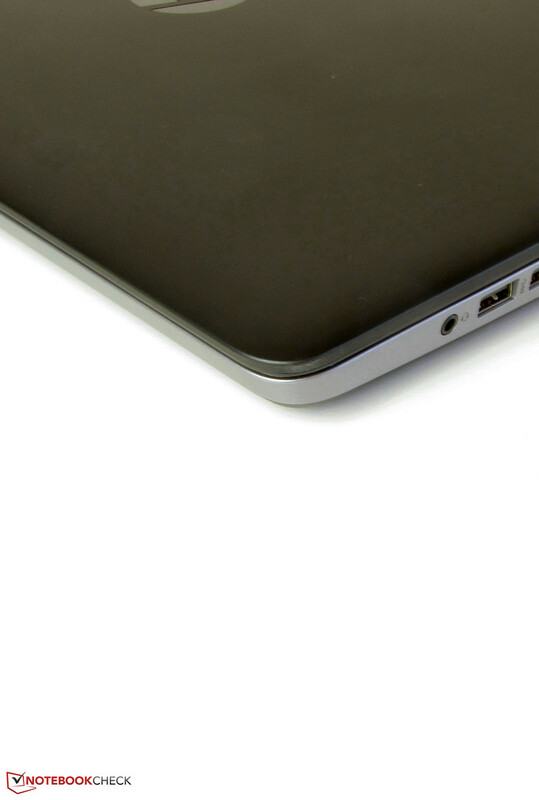 Dell's Latitude is interesting for users that do not necessarily need a docking port and an integrated 3G/LTE modem. You can get this notebook with a matte Full HD display and a powerful Radeon HD 8850M GPU for around 700 Euros (~$956). A similarly equipped ProBook would cost around 1,000 Euros (~$1366). The ProBook has a nice design. DVD burner reads and writes every kind of DVD and CD. ...keep the display in position well. The maintenance cover can be removed without tools. There are two memory slots. Replacing the hard drive is no problem. Experienced users could even replace the processor. The BIOS battery is hidden. An optional 3G/LTE modem can be installed above the WLAN module. 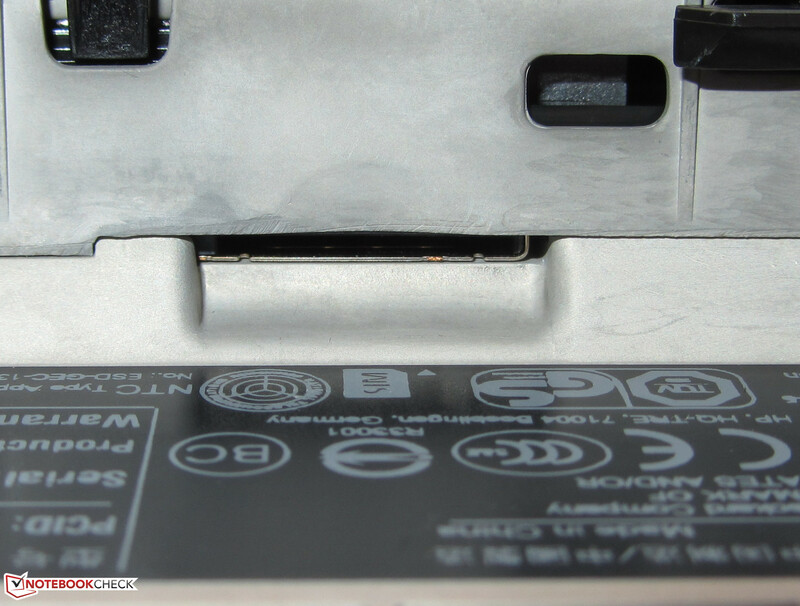 The according SIM card slot is in the battery tray. ...and has a capacity of 55 Wh. ...and has a nominal output of 65 Watts. The good application performance, the low system noise and the good maintainability. 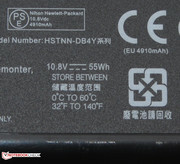 Despite a retail price of $1025, the ProBook has a display that can usually be found in a low-cost notebook.